(CNN) - The Senate confirmed Sylvia Mathews Burwell as the next health secretary on Thursday, paving the way for new leadership at the agency heavily criticized for the rocky rollout of Obamacare. Lawmakers voted 78-17 in confirming Burwell, 48, who was previously White House budget director. She replaces Kathleen Sebelius, who resigned in April following months of controversy over the early implementation of the Affordable Care Act, the politically charged health law that serves as Obama’s signature domestic achievement. Obama praised the Senate's swift bipartisan action in confirming Burwell, who he called "a proven manager who knows how to deliver results" and able to work with both parties. Senate Finance Committee Chairman Ron Wyden said Burwell's nomination "has a breadth of bipartisan support because she's really that good." "She's really that capable and she's really that qualified," the Democrat from Oregon said on the chamber's floor ahead of the vote. Sebelius came under heavy political fire as technical glitches and reports of dropped plans plagued the department amid the website launch. Issues with website eventually smoothed out, but the health care law remains a political flashpoint heading into November’s midterms. While some Republicans expressed support early-on for Burwell, unsurprisingly, opposition to Obamacare remains a key campaign platform for the GOP. Minority Leader Mitch McConnell, who's facing a tough re-election battle back home in Kentucky, said Thursday he’d vote against Burwell's nomination. 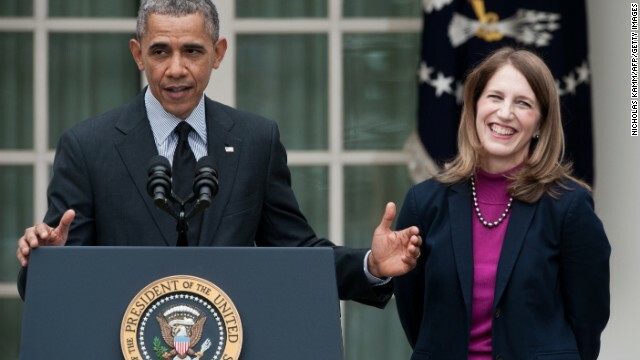 “By most accounts, Sylvia Burwell is a smart and skilled public servant. But her embrace of Obamacare calls her policy judgment into question," he said. Between October and May, more than 9 million people enrolled in health insurance plans under the Affordable Care Act. A CNN/ORC poll released last month indicated a majority of Americans want to keep the federal health care law as is, or make some changes to improve it. I wonder how the vote would have looked if Sen. Reid had not invoked a rule prohibiting filibusters for some appointments. Because you just know that the person charged with overseeing the implementation of the ACA would have definitely been filibustered by someone, and the votes would not have been present to break it, either. How's it going, Mitch, talking about your opposition to Obamacare when so many Kentuckians have signed up for it and are loving it (over 370,000 and counting)? 295 million Americans are now insured with the number of uninsured at record lows, yet red state governors refusing to accept Medicaid money have put over 5 million of their own citizens at risk. That to a GOBagger is republican leadership? Mitch McConnell lied to a reporter when he said that if they repeal ACA, Kentuckians will still be insured under The KY plan. When ACA is gone under GOP leadership?, so is KY's funding, along with the rest of the states. Maybe the GOP CLOWN GOVENORS should EXCEPT the federal money and STOP DEPRIVING their MILLIONS of RESIDENTS ACCESS TO HEALTHCARE. The GOP GOVENORS races are the ones to watch. Who cares if the GOP takes congress. That will insure that they LOSE the White House AGAIN in 2016 BECAUSE OF THEIR PROVEN INCOMPETENCe for the last six years. It will be 8 years of NONPERFORMANCE by then!!!!!! McConnell, the epitome of wrong headed positions all because of politics.